Part IV of the “Help me decide…” series. See parts I, II, and III. Motor neurons send signals to muscles, causing them to contract. You’d think understanding their role in the production of movements like breathing and walking would be simple. But as I explained in a recent guest post, these neurons are embedded in a larger network, and there are still many things we don’t know about their contribution to the timing of motor behaviors. A lot of my research, experimental and computational, examines how changes in motor neuron excitability could affect patterns of muscle contractions. a “subthreshold” synaptic input evokes a small graded post-synaptic potential (PSP), while a “superthreshold” input evokes a large all-or-none action potential. That quote is taken from Izhikevich’s book Dynamical Systems in Neuroscience (available in part here), and he goes on to explain why that definition isn’t useful…or even correct. The first problem is with the concept of a threshold. For whatever reason, many neuroscientists have fallen in love with the idea that there is a magical voltage at which a given neuron starts spiking. Introductory neuroscience classes are infected with this language (“the neuron is above threshold”) and include the compulsory figure with a dashed line drawn through the voltage at which the neuron’s world is divided between silence and activity. The truth is, there is no fixed threshold. There is a region in which firing is more likely, sure. But there is no unique cutoff that determines when the cell becomes excitable. The same goes for current. There is a range of current values in which a given neuron is more likely to respond, but no fixed current threshold. And then there’s the second problem with the above definition: all-or-none. Not all electrical signals produced by neurons are all-or-none action potentials. Neurons can generate graded potentials, meaning electrical signals of variable sizes. Should we not include this behavior in a description of a neuron’s excitability? In 1948, Alan Hodgkin meticulously recorded from the nerves of crabs, injecting different levels of current and analyzing the responses (available here). He grouped these into three categories, which later became known as Hodgkin’s excitability classes and are still used today to classify neural responses. But his classification had little to do with the exact voltage or current values at which neurons fired and more to do with how neurons spike when they receive input. For example, does the neuron fire only a single action potential (Class 3), or does it fire many (Class 1 and 2)? In neurons that fire many action potentials, does firing begin at low frequencies and increase as current increases (Class 1), or does it begin in a higher-frequency range and change only marginally with increasing current (Class 2)? Excitability is thus described in terms of the qualitatively different transitions neurons exhibit as they go from resting to spiking states. Underlying a neuron’s excitability is a host of ion channels that allow sodium, potassium, calcium, etc. to go in and out of the cell. There is a relationship between the types of rest-to-spiking transitions neurons can make and the type and number of ion channels they express (see for example pdf). Working in model systems like Drosophila, we can change the levels of channel expression in neurons and see how their excitability changes. Furthermore, we can target these manipulations to groups of cells, like motor neurons, to ask how changing their excitability affects motor behaviors. Below is an example of a genetic manipulation of potassium currents in Drosophila motor neurons (article available here) that I’ve used in my work (unpublished to date). On the left, we see the whole-cell potassium current measured in control animals. Potassium tends to leave the cell when channels are open, generating a large outward current that has both a short-lived component (the large initial upstroke at the beginning of the trace which decays rapidly), as well as a sustained component. On the right, we see the large reduction in both components of the whole-cell potassium current in EKI animals. 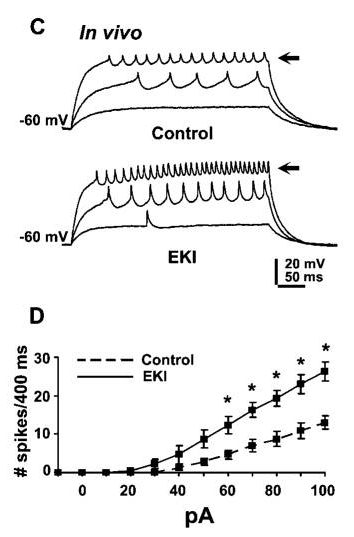 EKI stands for “electrical knock-in” and refers to the fact that neurons become more electrically active when potassium currents are reduced. We can see that the manipulation has an effect on the firing behavior of the motor neurons. But the question I’d like to leave you with for now is, does the EKI manipulation change the excitability of the motor neurons? Pingback: Why is yawning contagious? * – Pavlov?